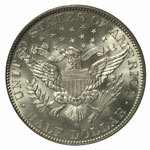 The Barber Half Dollar series is nearly unique among older United States issues in that it contains no key dates, those being coins that are rare and expensive in any grade. For this reason it is a good introduction to the collecting of vintage coins and provides an excellent opportunity for honing one's grading skills. Coined annually from 1892 through 1915, this type was produced by the mints at Philadelphia, San Francisco, New Orleans (through 1909) and Denver (beginning in 1906). Generally speaking the Philadelphia coins are well struck overall, as are those from the San Francisco Mint. 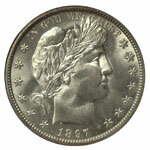 When found uncirculated, the 'S' Mint halves of the 1890s are often prooflike in that they have very reflective fields. This attribute is less common for the later dates, which tend to have the more conventional satiny or frosty luster associated with the other mints. The New Orleans issues typically are a bit weak in places, this weakness being most prevalent at the eagle's left claw (the one grasping the arrows) and at the arrow feathers. Another common weak spot is the upper right portion of the shield and the wing feathers immediately adjacent to it. These areas are directly opposite the highest points of relief on the coin's obverse, and there usually wasn't sufficient metal displacement to fill both dies fully. While such weakness is typical of 'O' Mint Barber halves, it may be found for any date and mint in this series. Another peculiarity of the New Orleans Mint halves is a swelling on Liberty's neck evidently caused by an injury to the die. This swelling, known as "mumps," is frequently seen on 1906-O, 1907-O and 1908-O halves, and it may be the result of improperly hardening the dies. New Orleans Mint correspondence has revealed that another cause of this facility's failure in fully striking coins was that it did not properly anneal, or soften, its planchets. Uncirculated Barber half dollars can be extraordinarily beautiful when well preserved, but sadly most have succumbed to careless handling over the years. The perceived aesthetic value of toning has been subject to shifting tastes within the collecting community, this natural patina being prized by one generation and reviled by the next. As a result, many Barber halves have been cleaned with varying degrees of skill and may show hairline scratches or a loss of luster. How these coins are graded will differ from one grading service to another, NGC rejects coins that are obviously cleaned while simply downgrading those that have light cleaning but which are still acceptable to the coin market. Those that simply won't make the cut may still receive a details-only grade from NCS, but it will be accompanied by a notation of the problem condition. Examining a number of certified Barber halves will enable one to get a feel for what is and is not an acceptable appearance. 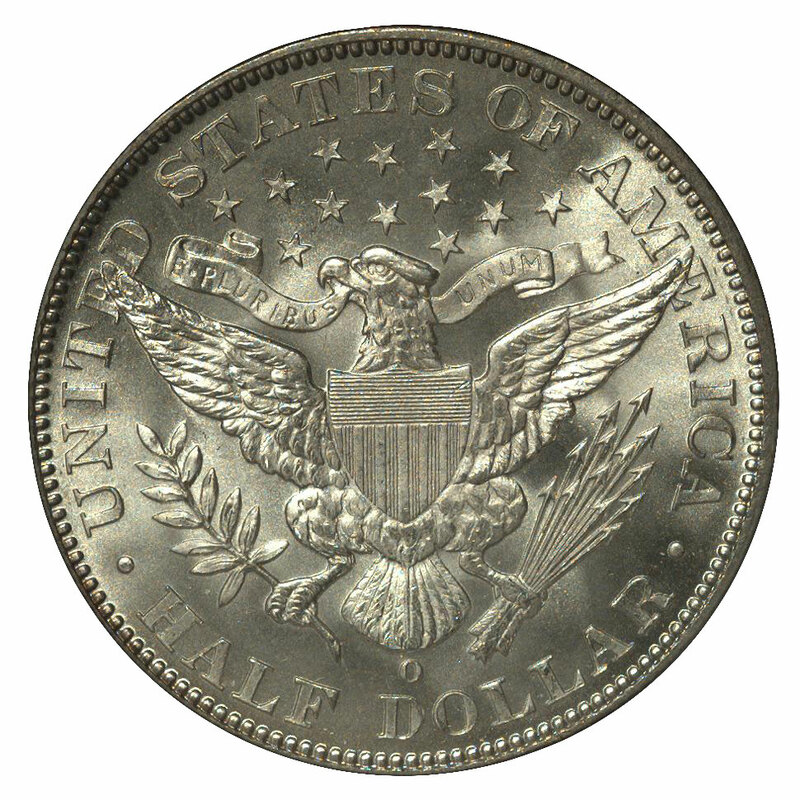 While type collectors will want to acquire an unworn Barber half dollar, most persons collecting by date and mint will have to settle for circulated pieces. Barber halves pre-dated the popular collecting of coins from circulation, which began during the mid-1930s. Though most of the dates after 1900 could still be found with some effort at that time and for a few years afterward, these coins were by then quite heavily worn. Thus, Barber halves survive primarily in grades below Fine. In fact, the grades of Fine through Extremely Fine are those most scarce and highly sought by date and mint collectors. Examples having their natural surfaces intact ("original" is the popular term) are always in high demand. 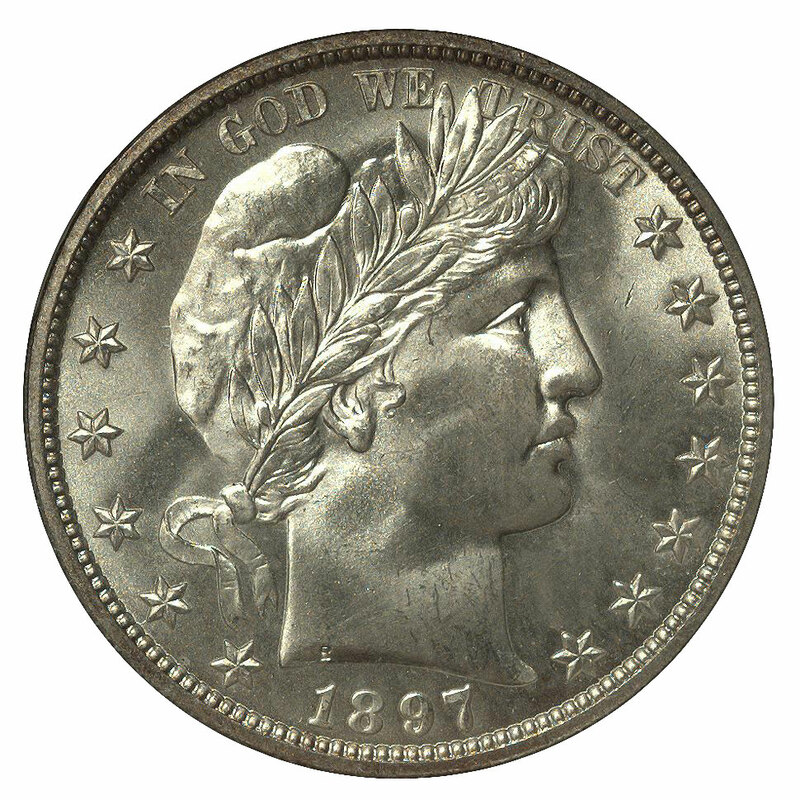 The master hubs for the Barber half dollar were revised in 1901, resulting in subtle design differences that affected the way these coins wore. A major element in the grading of circulated Barbers is the number of letters visible in LIBERTY. On coins struck from dies that were sunk from the new hubs, those dated 1901 and later, LIBERTY was not as well protected from wear. Thus, it cannot be relied on as much in the grading of circulated examples. While the letters of LIBERTY are still a useful guide, one must rely more on the coin's overall amount of wear to arrive at the correct grade.